Coming Soon! Chicken and Mushroom Pasty…mmmm! 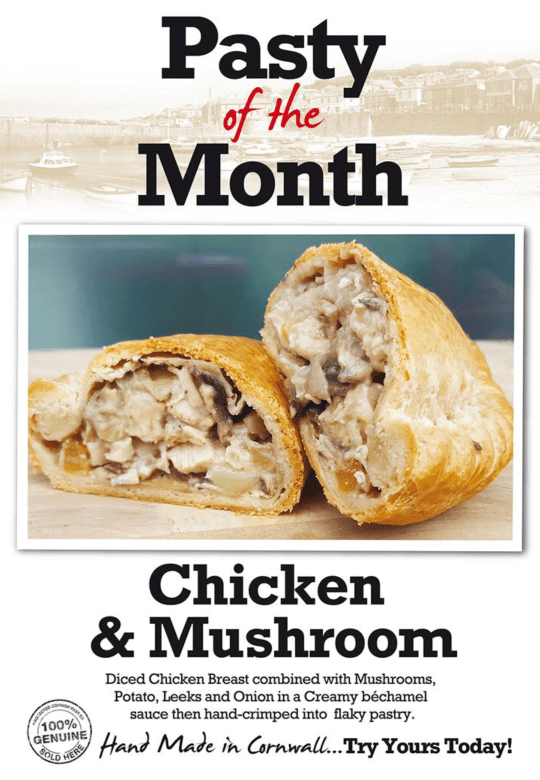 Available from 1st August as our special Pasty of the Month, Chicken and Mushroom, diced chicken breast, mushrooms, potato, leeks and onion in a Creamy Bechamel Sauce, all sealed in a hand crimped flaky pasty case! Ask at your van and try one while stocks last! Cornish Pasties by Proper Food 2U, South Yorkshire’s Favourite Hot Food Delivery Service! Proper Food 2U … Hot Breakfast Served Daily! Proper Food 2U Deliver Hot & Cold, Freshly Made Sandwiches to Your Workplace! What’s For Lunch Today? Are You Having Proper Food? Proper Food 2U serves Genuine Award Winning Cornish Pasties, baked fresh daily and served hot to your workplace. Choose from a variety of flavours, including Traditional Cornish, Lamb & Mint, Cheese & Onion (Vegetarian) and not forgetting Yorkshire’s favourite Steak & Hendersons Pasty. Each month we introduce a new guest pasty to offer customers something seasonal and different. Contact Properfood2u on 0114 243 8130 or send an email to sales@properfood2u.com, we’d love to serve lunch at your workplace tomorrow! We know how important it is for you to know that your breakfast and lunch has been made to a high standard and more importantly, that it has been handled in a safe and hygienic manner. A 5 Star Food Hygiene rating from the Food Standards Agency (FSA) goes a long way to confirming that we adhere to the strictest food handling standards.